K likes green. It's her favorite color. And she will walk up to most people and just say "Hi. I like green." K also loves elephants. We have so many plush and plastic elephants. I have lost count. 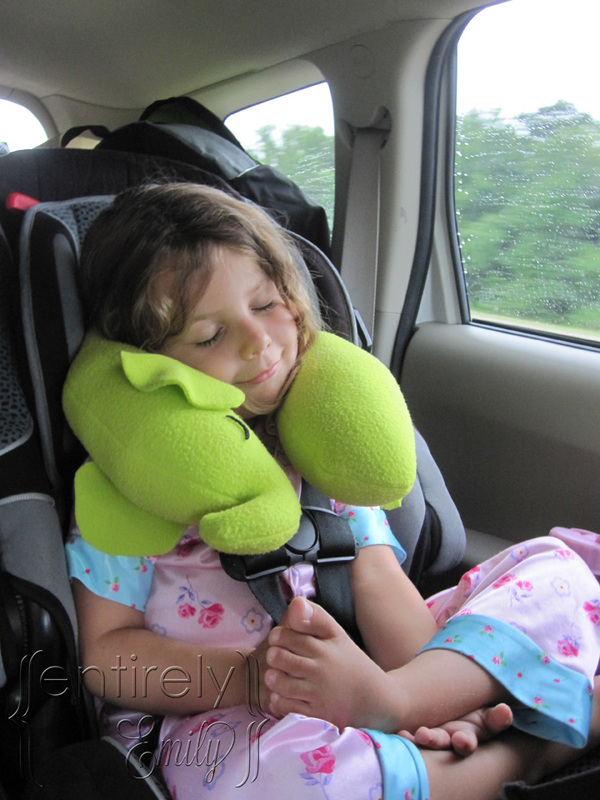 With our 15 hour road trip happening, I started looking at all of the kid travel pillows and I found them either too small or not fluffy enough to actually cradle a kid's head if they fell asleep. And besides all of that they were animals or colors K didn't like. I wanted her to be excited to use it. 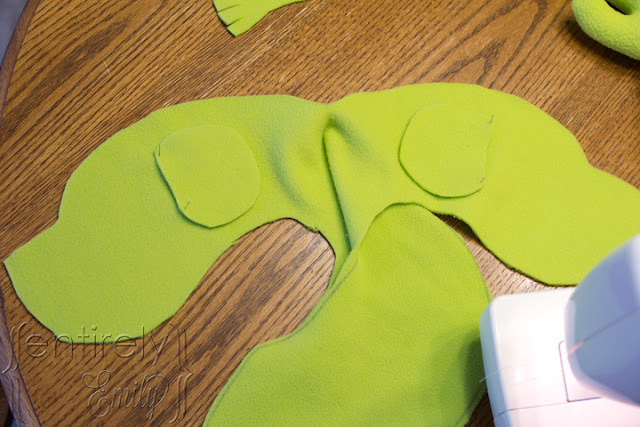 Since I save everything ( ok not everything but a lot of stuff) I had some left over green fleece from when I made Bunsen and Beaker costumes for Halloween.... four years ago. See, I wasn't kiddin'. I am a totally sewing novice so I had my mom there to help me and give me my first sewing class. 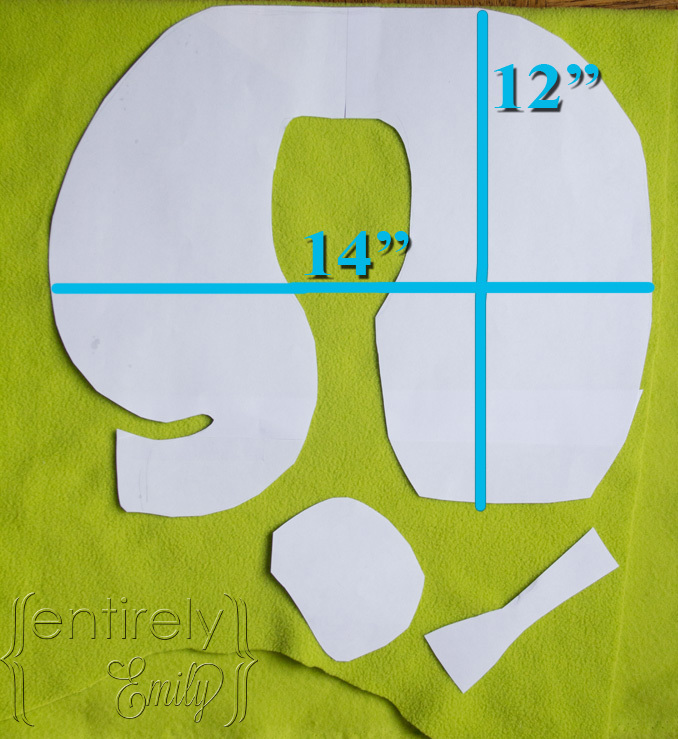 I have a very heavy sewing foot. And apparently I should have chosen something other than fleece for my first time on the machine by myself because she had to jump in a help me a few times. 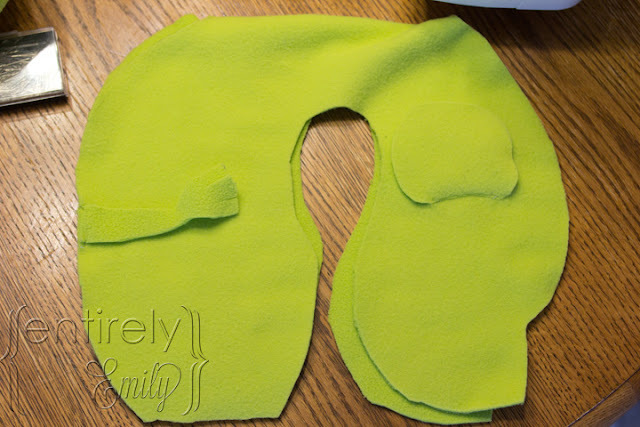 I started by pinning his little ears on and then sewing them to the inside so after we sew the edges we it can be flipped inside out and it will right. I then took the tail and sewed it on the inside as well on the edge so it will be with the seam. I sewed all of edges and around his trunk. I left the inside of the middle open to stuff in the fluff. When I was done sewing the edges, I had to turn him inside out and the only tricky part was his trunk. I used the inside of an pillow that was flat for the fluff. It worked out great. 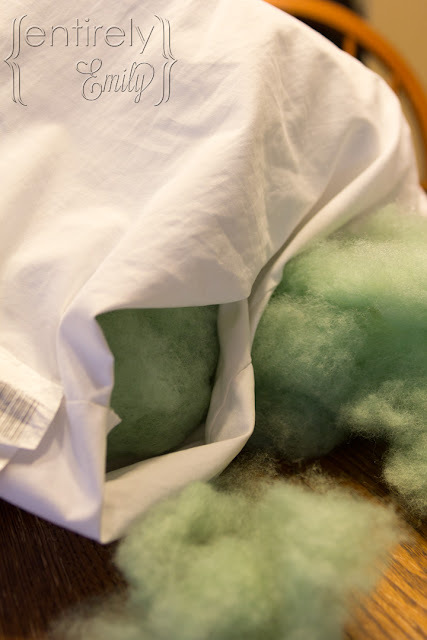 I didn't know pillow stuffing was green. Did you? 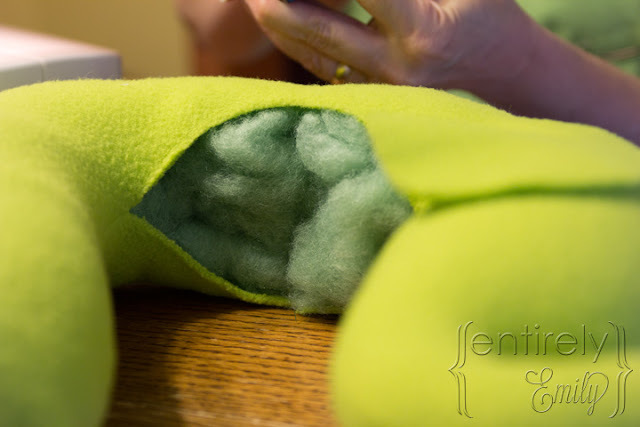 When I got the ends both as full as I could get them (for the puffy factor that is sooo important), I then had to take the material and do a whip stitch ( just around and around, my mom had to explain that to me alot) to close him up. 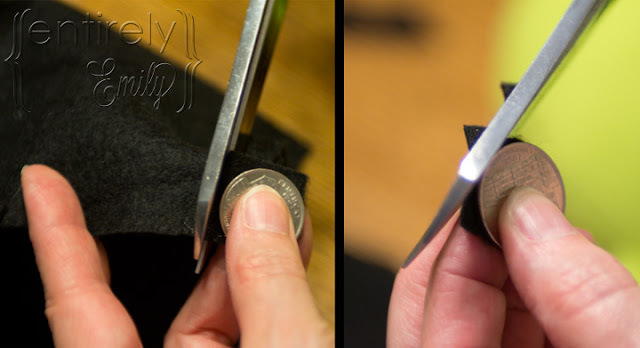 And it was kinda hard because even with some pins, you had to squeeze it as you were sewing. His insides were now stuffed to capacity. 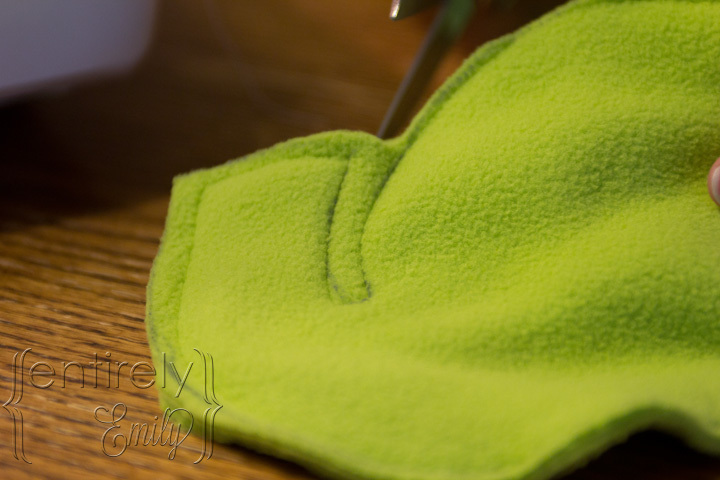 I also didn't realize that fleece stretches one way more than another. You learn something new everyday. He needed eyes. I decide to go the easy route with some black felt. I used a quarter to help cut the shapes into half moons and used some clear tacky glue from Micheals to glue them on. It may not be permanent but it will work for now. There he is and I actually had enough to make to for both the girls. The other one is how should I put this.... not so pretty. He won't make it to the blog. He was the first draft. But it worked for S. K loved hers and used it there and back. It worked so well to keep her head up. S wasn't into hers at all. I think it was the age thing. Ok....so this was staged but the nighttime ones are hard to get. Cute, great idea. I also have a green lover in this household! Thanks, thifty. Green is kinda hard to find in some things, isn't it? Thanks, Maxabella. I hope it does come across as easy as it was. This is getting Pinned! This is the cutest little pillow I have ever seen. Awww, Thanks for the pin, Michelle. Thanks, Alicia D. I feel like it's your rap name. hee hee. first - many thanks for visiting my website today! I love the pillow - it's adorable. 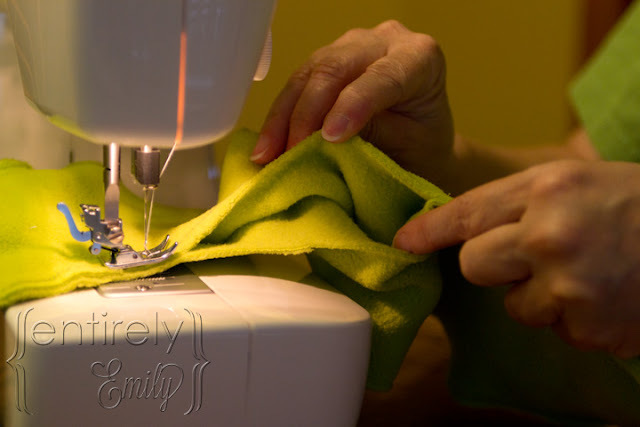 I just learned to sew this year - I took a sewing class in January - but I don't think I am creative enough to create my own pattern to make something. Kudos to you!! Thank you so much and I love your site. I'm always interested in learning more about anything Disney. Suzy-SO true. It was even fluffy enough for me since I was the tester. Maybe you can find some kind of manly fabric for your hubby. Found you on take it on Tuesdays link party. 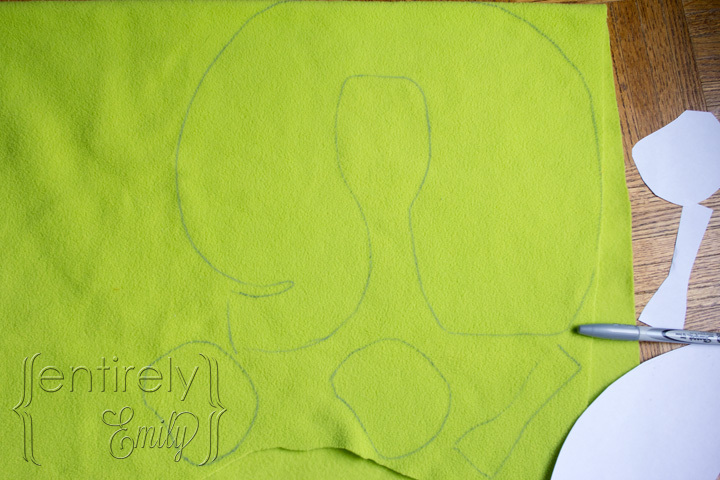 This is such a cute project I've pinned it to my kids sewing board! :o) Thanks for sharing it! Thanks, Leslie. and thanks for the pin. OMG!!! I want it!! It looks sooo cozy! Great tutorial! Thanks, Shelby. I was kinds up in the air about the eyes but I really liked them. Great tutorial! I want to make one for both of my boys! :o) Really adorable! Thanks, Hope. If you do , I'd love to see them. That is SOOO adorable and very practical. I love the picture of your daughter using it. She looks so peaceful. Thanks for linking up at Romance on a dime. I'm pinning this. 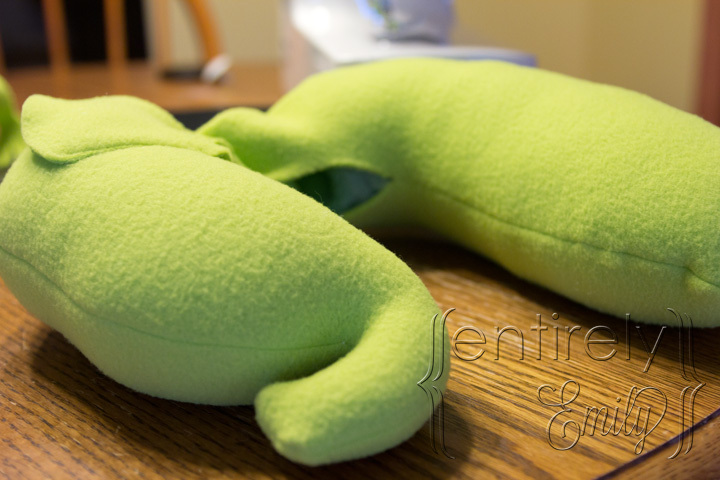 I love your elephant travel pillow. Such a cute idea. The pic with your little one sleeping is adorable. I know I'm behind, but I wanted to thank you for stopping by my blog. Thank you so much and no problem, It was a great post. Thanks ladies and I'll be there. Wow, that is so cute! I can see that your little princess is quite enamoured with her new pillow! Thanks so much for your sweet comment at my Christmas blog-you really made my day! I'm following you now too and look forward to reading your blog. I also wanted to invite you my other blog, Natasha in Oz. I host a weekly link up over there each Saturday and I would be thrilled if you could join in one weekend! Well, hope your week has been fabulous. See you again soon! Thank you Natasha. She does love the pillow. I'd love to stop by and link up. I hope you week is good as well all the way down under. This is so cute! 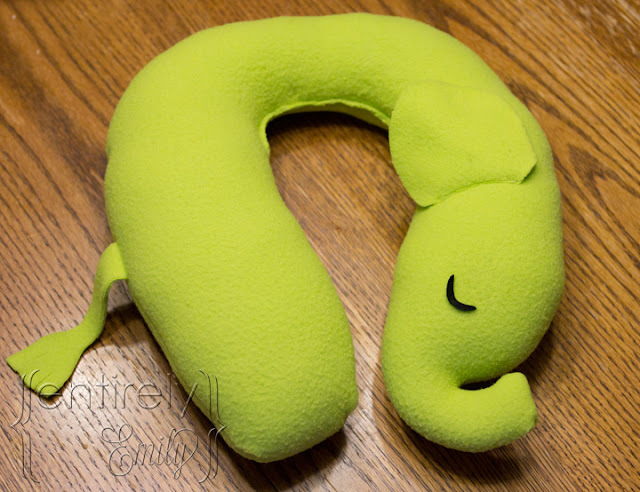 I made my little boy a neck pillow a couple of years ago, but I think I might need to make a couple more--who wouldn't rather have an elephant to cuddle instead of a plain pillow?! Thanks for sharing! Thank you, Kristy. I know, right? I would probably make myself a horse one if I had to choose and animal. Oh what a talented little girl you are! That elephant is just adorable. I used to worry about the kids getting a kink in their necks when they feel asleep in the car but we didn't have travel pillows back then. I so wished I sewed better, I just might try to make this for my grandkids. Thank you for sharing at Freedom Fridays. Thanks, Evelyn. But if I can sew this...anybody can. I'm really not super good at it. You can do it!! This is a great tutorial and perfect for Summer travel! I'd love to invite you to join us on Saturday Show & Tell at Cheerios and Lattes! I know my readers would love this idea too! Thanks, Mackenzie. I'd love to. See you there. I LOVE this Emily...I'm featuring this from the Toot Your Horn Party from last week...just adorable! 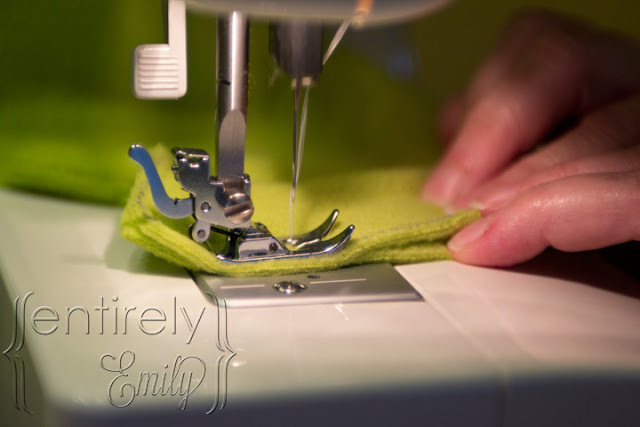 I wish I knew how to sew better, but the tutorial is great! Your little one is lucky! Thanks for linking up and sharing with us! And, congrats for the feature! Would love for you to come grab your button...and, can't wait to see what you link up with us again! Thank you so much, Erin. I'm so honored. It really is alot easier than you think. I'm not s great sewer yet so if I can do it you can do it. Thanks again. LOL... you're so funny. Thanks you so much Evelyn. I grabbed my button and shared this week too. Have a great weekend. We're planning a little road trip in about a month, so I think I need to make one of these. Thanks for the tutorial! Cool. Thanks. I hope it works out for you. I'd love to see a picture when you finish. One good thing that you need to know is that you can lessen the tiredness that you may feel as you travel. You can actually sleep and relax while traveling. One thing that you will need for sure is a pillow. Yes, that is good to remember.